The start of every season sees a tipping point, where the glacial waters previously populated by the brave few are suddenly swelling with fishers who will commit only to a springtime start. It’s a time to sort out which water-repelling items will make the cut, and which need replacing. The following is a varied assortment of items that excel in their respective product categories. Wading gear is product category that has gone through drastic changes in the last few years. GORE-TEX was the first big game changer many years ago. Lately, manufacturers of both waders and wading boots have really focused down on comfort, usability and durability, and we are now (gladly) faced with a great array of premium to mid-priced products that make our days – or precious hours – on the water that much safer and enjoyable. Bargain-bin wading gear weighs a lot, and the first standout difference in every item below is weight reduction. To put a finer point on it, manufacturers are being ruthless when faced with materials selection. Not light-weight? Then it just won’t make the cut. 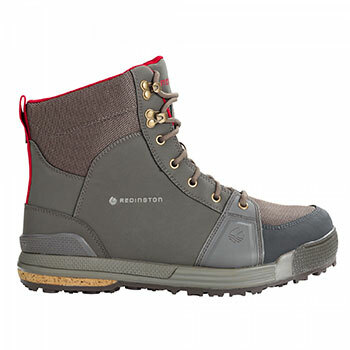 The Redington Prowler Sticky Rubber wading boot stands at the top of the heap in this department: they come in at an impressively lean 820 grams. They’re also fashioned with a wide toe-box. These are boots to consider when you’re spending long days on the water and insist on comfort all the way through to the final cast. They’re also built a little ‘heel-heavy’ which assists with the balancing act required in a moderate current. Overall, the Prowler is a little more flexible than most wading boots, which again raises the comfort level. Footbed is snug and medium-hard. Anti-abrasion panels all around as well as the requisite heavy-duty hardware. Stud-compatible, and an excellent value at $149. The SIMMS Currents is the company’s latest wet shoe, but rather than rely on their last (excellent) model as a springboard, they’re offering a totally revamped wet shoe. The Currents shoe is different in two ways: its construction is based on seamless TPU welding technology – the kind normally used to build top-tier waders. This means that far less bonding adhesives and materials are employed in the shoes’ construction, resulting in a more streamlined design and a lighter shoe overall. SIMMS also added a surprisingly stiff (nonmarking) outer sole, noticeably stiffer than most other wet shoes, and the benefit here is remarkable stability. Usability is addressed with a quick bungie lacing closure and elasticized heel belt. Quick-dry mesh upper makes for speedy drainage. They also look quasi-sneaker-like and won’t be entirely out of place at the fishing lounge. Siped for maximum slip resistance. 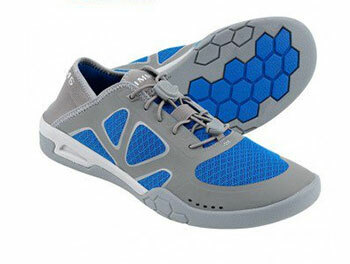 Additional features include EVA footbeds and Agion® anti-odor technology. Pair weight (size 11) 20.8 oz / 590 g.
Getting to a lodge with soaked wearables happens more often than people admit. When the weather turns really wet, even your luggage becomes an important factor. Two items that get the job done in that department are Patagonia Black Hole series back packs and Fishpond’s Westwater large rolling duffel. The rolling Zippered Duffel has two somewhat contradictory things that make it special (three if you count the fact that virtually 100% water resistant). First, it allows you to bring along 6,400 cubic inches worth of stuff – which I’ve conservatively calculated to be 10 days’ worth of all your gear, both wearables and fishing gear (my test included 3 rod tubes). The second is that, despite its size and rugged hardware, it weighs in at very light 8.5 pounds. 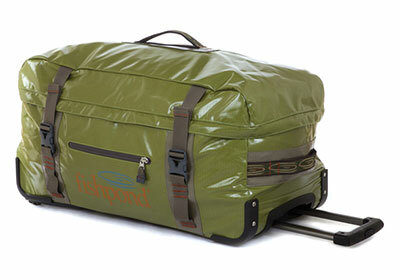 Note that many large-sized rolling duffel bags clock in at 13+ pounds. Clearly, engineers and designers spent time creating a bag that will satisfy even the most demanding travelers. I particularly appreciated the military grade wheels and wide carrying handles (both regular and integrated aluminum telescopic handles): the wheels are large enough to handle the roughest terrain and I went a step further by rolling a (fully loaded) bag on wet sand. Mission accomplished without a hitch. I rinsed off the sand and it didn’t affect the bearings one bit. Built with laminated, heavy duty recycled fabric with water resistant zippers, the bag is feature-rich. See Fishpond website for details. Highly recommended. I tested the Patagonia Black Hole series backpack (25L model) in a springtime downpour and it offers the same water impermeability that the Fishpond rolling duffel does. Everything in it remained bone dry. The main reasons I liked this pack are that even if stuffed, its strap shape and configuration, along with the medium-soft molded (water shedding) back panel, make it very comfortable to trek with. Additionally, the pack is tailored to pack very flat to your back. Coupled with a minimalist exterior, this is the most snag-proof pack that I’ve tested to date, enabling you to hike through dense woods without worry. 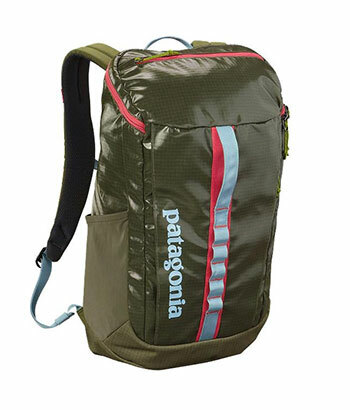 Patagonia employs 13-oz 450-denier ripstop with a TPU-film laminate and a DWR finish to build the pack, meaning that it will protect your gear from scuffs and scrapes and will endure miles of rough handling. Features 5 low-profile daisy chain lash points for your fishing instruments. This is a full-day back pack that offers value that is hard to beat. The SIMMS Kinetic Jacket has garnered kudos for numerous reasons: it’s slick and easily tucks comfortably under waders without the binding you would get from a fleece garment. The elasticized underarm (right down to and including the cuff) moves naturally with the body – making it an excellent jacket for casting and rowing. It’s made to perform in a wide temperature range and is usable for spring or fall fishing: insulated with just enough PrimaLoft Gold insulation (which according to SIMMS maintains 96% of its warmth when wet and provides a high warmth-to-weight ratio) to keep you warm in chilly conditions, yet allows heat dissipation when temps start to climb. 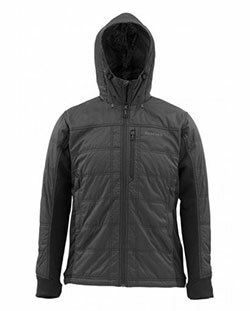 Includes a low-profile insulated hood. This is a truly innovative layering piece. Of course, water beads off it. Highly recommended. Weight (size Large) 18.5 oz./525 g.